Game review: "A Situation Like This Requires...precison." "A Situation Like This Requires...precison." Npc10000 here with another review. Seeing how this is my fourth review in two years, and my previous review was only a few weeks ago, proportionally speaking, this is a massive influx in activity! :D So kudos to myself. Levelorange011 has an�interesting story on the Forums, to say the least. For sensitivities� sake I won�t say what exactly happened (even I�m still confused about it) and I won�t let it affect this review. 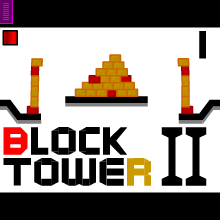 Anyways, I stumbled upon BlockTower 2 on the Featured Games page, and it looked intriguing enough, so I started playing. And I was pleasantly surprised. Like The Dangers of Legos, it actively manages to balance puzzles with brain-twisting difficulty. UNLIKE The Dangers of Legos, however, this game excelled in craftsmanship and satisfaction, and it delivered in game-playing experience. The premise of the game isn�t THAT original�you have a series of loosely constructed towers and structures composed of precariously-balanced bricks: red, bronze, yellow, blue, etc. In the top left-hand corner is a shining red cube. The object of the game is to somehow dislodge the red (and sometimes yellow) bricks from the tower without making any of the other bricks fall of the map, and drag them over to the cube, where you earn points (red=1, yellow=2). When I say the premise isn�t �THAT original,� I mean that I�ve seen this type of game before on Sploder and other sites. But BlockTower 2 is an exception because it is much more well-executed and superior to all the other games. The attention to detail in this game is outstanding. The design, layout, and color scheme of every single level follows a same general formula, though the staggering variety throughout them is enough to make each level unique, and it really helps give the game a defining personality. The titular block towers aren�t haphazardly thrown together; they have a legitimate structure to them, and the size and shape of the bricks are varied to offer new architectural ideas and new ways to solve the puzzle. Oh yeah, puzzles: for the most part, this game is PURE puzzle/strategy; it�s one of those games that defines the game creator�s name: Physics Puzzle Maker. Regarding the block towers, you have to remove the bronze blocks one by one and place them somewhere else so you can reach the red/yellow ones, while also making sure the pile you�ve made doesn�t topple over. Precision is your mistress in this game. You find yourself oh-so-carefully dragging the bricks so that they don�t knock over the piles or touch other bricks, because in this game, one wrong move could send a pile or tower crumbling down. I found myself shouting �NOOOOOOOOooooooooo��� as, in the final few points of a level, one misguided motion sent the blocks falling to their (and my) demise as the trademark �WAOWAOWaowaowaowwww�.� sound of a Game Over played. It truly is humiliating to be put to shame as all your hard work comes crumbling down with one stupid move. Then it was back to the hand-numbing motions. Throughout the later levels, BlockTower 2 offers some variety: gray bricks are marble, which cannot fall off the map, therefore opening up more opportunities to solve the puzzle; red platforms explode upon impact, therefore ending your game right then and there, etc. etc. While these additions were creative and broke up the monotony for the most part, I found that in some levels, these new features would inadvertently open up insultingly easier methods of solving the puzzle. Some of the methods I used to solve the puzzle were border-line game breaking, I have to admit. You know what level took me the longest to complete? Level 1. 6 of the 20 minutes I spent on this game were dedicated to Level 1. I don�t know if it was just because I was trying to get used to the game or what, but somehow the basic structure of the game turned out to be the most challenging. The later levels, while more creative and requiring more strategic thinking, turned out to be the easier of the bunch. The game also features a boss fight, apparently the �greatest BlockTower 2 player in the world� (or something like that), who resembles what would happen if you crossed a Minion from Despicable Me and Springtrap from Five Nights at Freddy�s 3. It was a refreshing twist to the game, and although it still required precision and quick reflexes, it was different enough to be a welcome surprise. I can honestly say I enjoyed playing BlockTower 2. It was an effective, mentally-aerobic use of 20 minutes, and I would definitely recommend it to you all to play. Feature worthy? Yes, I actually do think this game deserved its feature. It�s not a grandiose game with spectacular scenery or anything like that, but rather a unique puzzle game that stands out on its own.